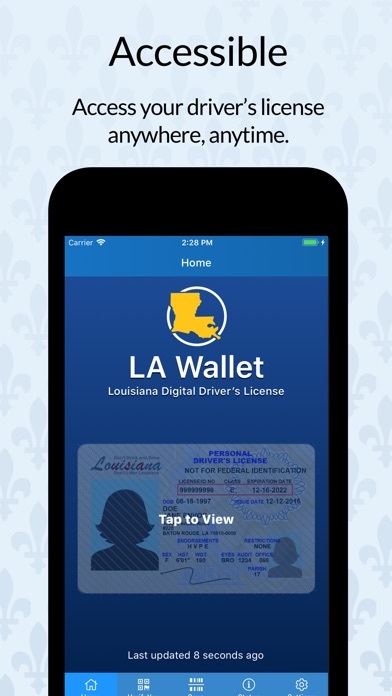 The app will allow you to keep a digital representation of your already-issued Louisiana-issued state ID or driver's license. 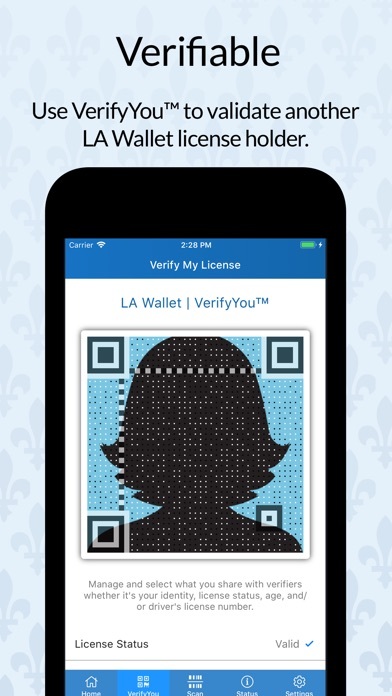 The app will generate a unique image that is 100% Legal for driving purposes per Louisiana law of Act 625 of the 2016 session with growing acceptance to include restaurants, bars, and retail outlets. 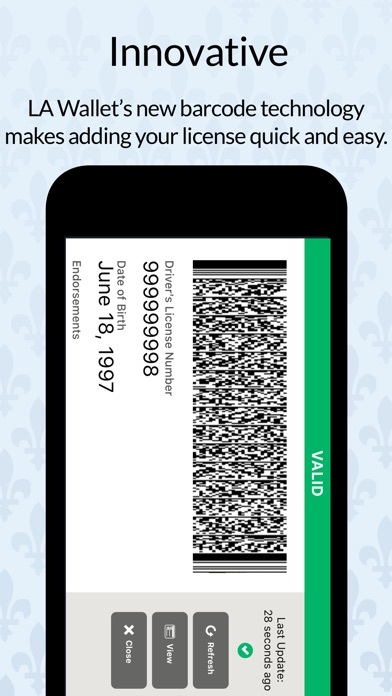 An in-app purchase of $5.99 activates it for legal usage for the same term as your physical Louisiana Drivers License. 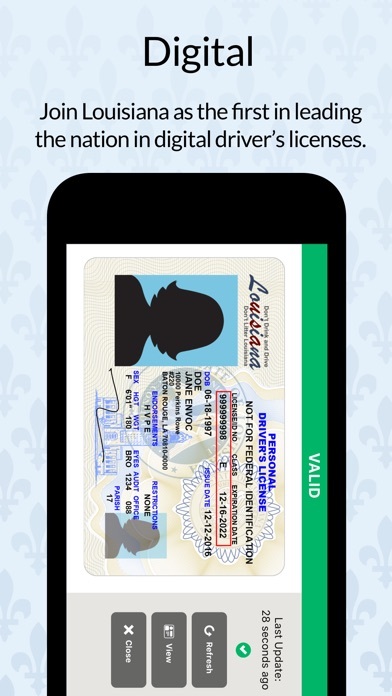 Louisiana State Police has agreed to accept the image and information about your Louisiana driver's license as it appears and is rendered dynamically on your mobile device with tamper-proof seals. I have tried to use this many times and it is “not accepted” at many businesses. Walmart, Home Depot, etc... save your money. 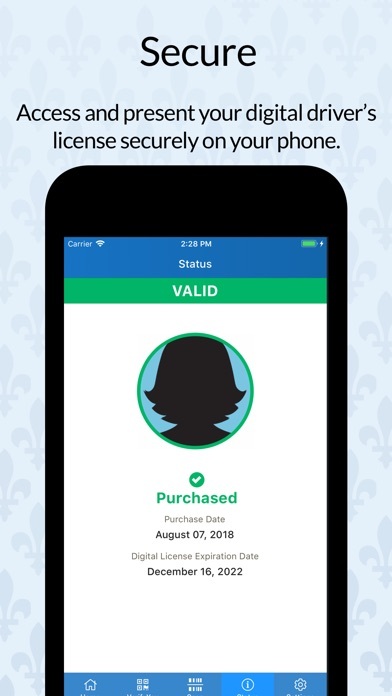 Great app but I can’t seem to purchase the ID because it’s asking to verify payment info. When I go to do that faceID automatically logs me in but it still asks me for a password, which I can’t enter. Would not work. Called in and they were able to fix the issue. Works great now. Not many uses now but this will be the future. It doesn’t make any sense to charge $6 for I license I already paid for. Just did mine. Now if we can add our state car insurance and registration to this app so everything is one place, it would be absolutely amazing. Great job!! It took me two days to set it up. Merchants will not accept it and now the police will not either. If stopped, you need your real license. How Many License Can U Add?! ?